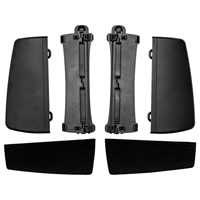 The RollerWave3 is designed to replace the two removable foam pads that come standard with the RollerMouse Pro3. The replacement unit plugs into the slots on the frame of the RollerMouse Pro3, providing a larger surface area for resting the palms. Like the leatherette pads it replaces, the RollerWave is designed in a contoured shape to maximize comfort, is made of the same materials, and can be cleaned with mild soap and water. 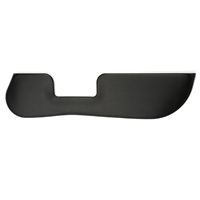 Available in black only (RM-WAVE-03) it weighs approximately 1 lb. The dimensions are 5" x 20" (adds 2" to the depth of the RollerMouse as originally configured). 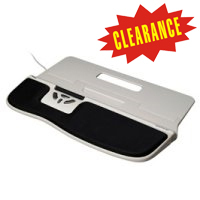 NOTE: The standard palm pads which come with the Rollermouse Pro3 are not available as an accessory. The RollerWave3 is not compatible with the RollerMouse Free3. 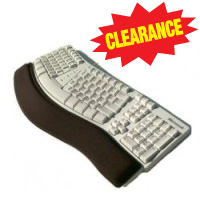 The RollerWave is designed to replace the two removable foam pads that come standard with the RollerMouse. 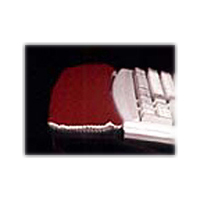 The replacement unit plugs into the slots on the RollerMouse's frame, providing a larger wrist-resting surface. Like the foam pads it replaces, the RollerWave is designed in a contoured shape to maximize comfort, has an improved foam 'gel', and is fully cleanable with mild soap and water. 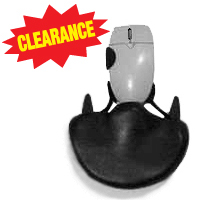 Available in both white (RM-WAVE-01) or black (RM-WAVE-02), weighs only 1 lb. Dimensions: 5" x 19.875" (adds 2" to the depth of the RollerMouse). 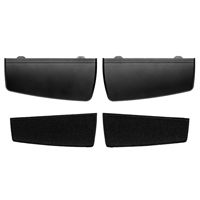 NEW - RM-WAVE-LP - a more inexpensive version of the RollerWave is now available which is made of solid plastic making it far easier to clean and resistant to static and dirt buildup. The RollerWave LP is composed entirely of synthetic materials and thus has no padding or extra layers. Because of this, it has an extremely low profile, which means that RollerWave LP gradually tapers down to the worksurface. RollerWave LP has also been expanded somewhat to the left, to provide optimum support for the left arm as well as the right. 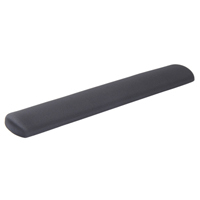 Its smooth surface minimises friction when you move your hands around the keyboard and RollerMouse. The finish is matte, so there is no unwanted reflection. And last but absolutely not least, RollerWave LP is easy to clean, which makes it especially well suited for computers that have several users. All Rollerwaves are compatible with the RollerMouse PRO, RollerMouse PRO2, and the Classic RollerMouse. The RollerWave is not compatible with the RollerMouse Free. The versatile and portable Gel Plus Palm Pads from Softworqs provide occasional palm support whenever it is needed. 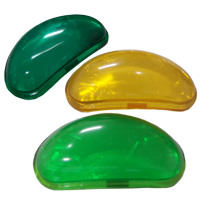 The palm pads are available in translucent colours (see Price and Availability table for details), or covered in Lycra fabric (see Classic Gel PlusPad). 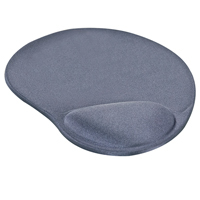 This contoured mouse pad from Aidata has a raised, gel-filled area at the front to cushion the palm or the heel of the hand. 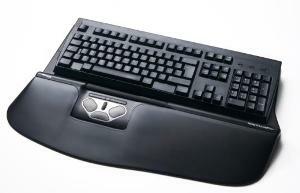 The surface is covered with polyester fabric, and a non-skid polyurethane rubber backing keeps the mouse pad in place on the desk top.